50 Inlet Cove. Beachfront. Beach. Biking. Nature. Trails. Tennis. Golf. Resort. Kiawah Island. Charleston. Sweetgrass Properties. Sweetgrass. Vacation. Summer. Pool. River. 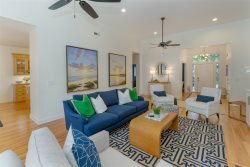 Located along a tidal creek of the Kiawah River and only 3 blocks from the beach, the gated community of Inlet Cove Cottages is a perfect family vacation destination. Swimming in the community pool, fishing, crabbing, and beach combing, are just a few of the many activities waiting to be enjoyed. Kiawah Island also offers five championship golf courses, two tennis centers, parks, over 30 miles of bike paths, plus 10 miles of white sandy beaches. When driving up to the cottage, you can't help but notice the beautiful views you won't be able to take your eyes off of the whole trip! You have ample parking in the car port and driveway. It even has an outdoor elevator to help with luggage and groceries. Once you make your way to the main floor, you will notice the open concept living and dining area. With comfortable furnishings in the living room and flat screen TV, you are sure to relax. This area is open to the dining table, seating 6, and flows in to the kitchen that also has a table for extra eating space. There are 3 bedrooms and 2 baths in this cottage. The Master bedroom will be off the living room and connected to the back porch. This room has a queen size bed, private bathroom and flat screen TV. The second and third rooms will each have two twin beds and share a bathroom. Relax on the lovely screened porch with amazing water views. For your convenience, this cottage does come with a washer and dryer, as well as WiFi. Need more space? We also manage the house next door, 51 Inlet Cove! The people at Sweetgrass Properties were wonderful. They responded quickly to our need for a last-minute vacation spot to replace one that was cancelled by another company 12 hrs prior to our scheduled time to leave for vacation. Sweetgrass made sure we had all of the information we needed so that we could leave for vacation with the assurance that the property we reserved through them would be ready and waiting for us. We arrived to a clean air-conditioned cottage, with plenty of ice in the freezer, and some lights left on to greet us. We would book through them again in a heartbeat! IC50 is in a great location if you cant find a property right on the beach. Beach access is close, 10 min walk or 3 min drive. The rental is located right on the river with great sunset views. The neighborhood is shaded with large trees. The only thing I recommend are better quality linens and pillows, as well as kitchen utensils and dishware. Overall the house is a good find for the price. Perfect location. Kiawah Island is gorgeous. Everyone on your staff was extremely helpful, friendly, and eager to ensure that we had all that we needed. We worked primarily with Sarah Quinn, but the others were helpful too. I particularly appreciated their thoughtfulness when I needed to have something important mailed to me while here. We have really enjoyed the beach, the bicycle/leisure trails, the beauty of Kiawah, the wildlife, and a month's worth of perfect weather. This morning, along the small inlet beside the cottage, we saw a small bobcat! As for the property specifically, it is cozy, comfortable, and clean, and has been a delightful accommodation for us.